It’s Children’s Mental Health Week, and the charity, Place2Be, have themed 2018 for children, young people and adults to celebrate their uniqueness. It’s all about #BeingOurselves. Place2Be provides emotional and therapeutic services in primary and secondary schools, building children's resilience through talking, creative work and play. For Children's Mental Health Week they're inviting everyone – children, young people and adults – to come together and celebrate the unique qualities and strengths in themselves and others. Having a positive view of ourselves can help us to cope with life’s challenges and make better connections with others. At the same time, celebrating the unique strengths of the people around us can enable us to come together in our schools, workplaces and communities. One in ten children aged between 5 and 16 years (three in every classroom) has a mental health problem, and many continue to have these problems into adulthood. Among teenagers, rates of depression and anxiety have increased by 70% in the past 25 years. NHS England estimates that poor mental health costs the economy, NHS and society £105 billion a year in England. This year Place2B's patron, The Duchess of Cambridge has recorded a video message for the day. The charity has published quotes from children that show how their mental health can be impacted by even small things. It's not unique to today, many of us remember feeling similar to these things below, but it does seem to be more intense in our ultra-connected, hyper-social world. Though it's not all doom and gloom. Many children do have good self-esteem. 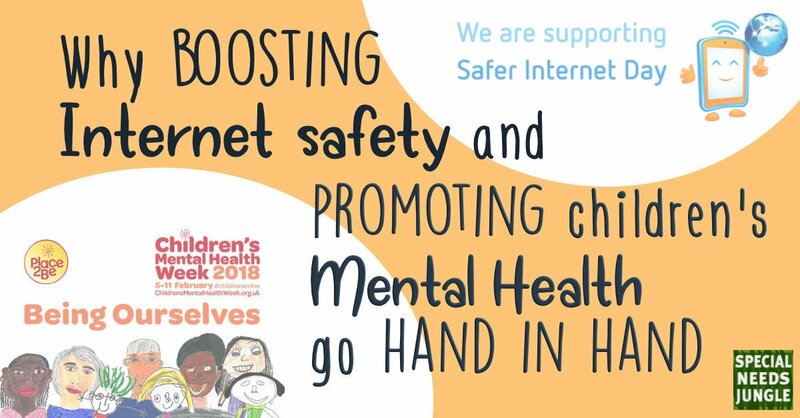 During Children’s Mental Health Week it is also Safer Internet Day –(Today, Tuesday 6th Feb). The 2018 theme, "Create, connect and share respect: A better internet starts with you" is a call to action for every stakeholder to play their part in creating a better internet for everyone, particularly the younger web users. More than that, it's an invitation for everyone to engage with others in a respectful way in order to ensure a better digital experience for all. That means thinking before you type something that you would never say to someone's face. You might think it's funny, but would you still think that if it was directed at you? It's equally important that as parents we support our children to keep themselves safe online, not just for their mental health's sake, but their overall physical safety too. Check out the UK Safer Internet Centre for a parents' pack to help you to help your child. The aims of Safer Internet Day and Children’s Mental Health week, are intricately linked given the amount of time many young people spend on social media. So how can we help our children to be safe online and feel good about themselves? The content and experiences that children can find online can have a direct impact on how children can perceive themselves. They have access to a wealth of information that was certainly not around when I was a child and they can access this from the comfort of their own homes, if not their bedrooms. With the multitude of online destinations, unexpected risks are not hard to stumble across, whether on social media, YouTube, online gaming or chat rooms, or even just generally surfing the net for their homework or special interests. My autistic son stumbled across an undesirable site completely accidentally recently when he was googling, looking for one of his special interests. He was preparing for cold weather and had become very interested in disposable hand warmers, deciding that he needed to purchase hundreds of the things. He googled ‘Little Hotties’ which was the brand name of the product he wanted in our local camping shop and I am sure you can guess what came up in the search results. He was completely mortified that this had happened and was absolutely beside himself despite this happening when he was sat with us in the kitchen and we reassured him completely that he had done nothing wrong. He apologised for days afterwards and still talks about the incident now, needing reassurance about what he is searching for. He has lost some confidence in himself and he needs our support to build it back up. In the grand scheme of things, this was a relatively mild situation and thankfully, we were there to intervene. But there are many children who can’t or won’t share with their parents or guardians when the internet becomes sinister or they don’t have the ability to know or understand when someone is trying to groom or exploit them. The impact on a child’s mental health when they have been subject to bullying, grooming or exploitation can be life-changing, or in the case of Breck Bednar, who was murdered by his online groomer, completely devastating for his family. Other young people have taken their own lives after being constantly bullied with the end of the school day being no respite. Our children have access to people and websites run by unknown people and even us, as adults often have no idea either. So how can you help your child be safe online? Educate yourself so you know the dangers of what unsupervised internet access can create. Ensure you know where they are going online and use parental controls on their computer and those provided by your ISP so you are comfortable that they are not wandering into dangerous territory. You can also use your hub settings to limit online access to individual devices and block adult content completely. Ask questions about what they are doing and which sites they are using for chat facilities. Remember to keep the questions open: using what, when, why, how and who are good ways to ask open questions. Be patient. Children can easily become sucked into the world of online gaming and may become defiant or resistant to your requests to come off. Try entering their world so that they can re re-attune your world – you may have to go and sit with them while they are playing, or ask to join in with them and this will gradually bring them back into the real world – be prepared for this to take time. Listen to your children when they talk to you - really tune in - if you listen to the little stuff, they are more likely to feel able to share the big stuff with you. Keep calm. If your child wants to tell you that they are worried about something online, they will need to know that you will not get angry. If they fear your reaction they won’t share their worries. Notice their behaviour patterns. Has your child’s behaviour changed in anyway at all? If so then try and gently talk to them. Model what good internet safety looks like so your children know when to ask for help. Be confident about having difficult conversations. Yes, talking about grooming and sexual exploitation might feel awkward, but dealing with the consequences if you don’t are far more difficult. Be upfront and honest. If you have concerns, tell your child and work together to try to find a solution. This is often how the best outcomes are reached. And remember to look at the parent’s and carers pack on the safer internet centre website. If you have any other tips or suggestions please do add them to the post below. Below are some useful links that have been mentioned and some others too. SNJ: Who's looking at your kids photos online, and not in a good way?